When it comes to achieving a bright, white, and healthy-looking smile, there are a lot of teeth whitening options available at the store, such as whitening strips, kinds of toothpaste, and rinses. You may also try natural methods such as eating strawberries or brushing with baking soda – the opportunities are endless when it comes to trying to attain the perfect smile. However, as effective as some of these teeth whitening treatments may be, professional teeth whitening can be more beneficial. 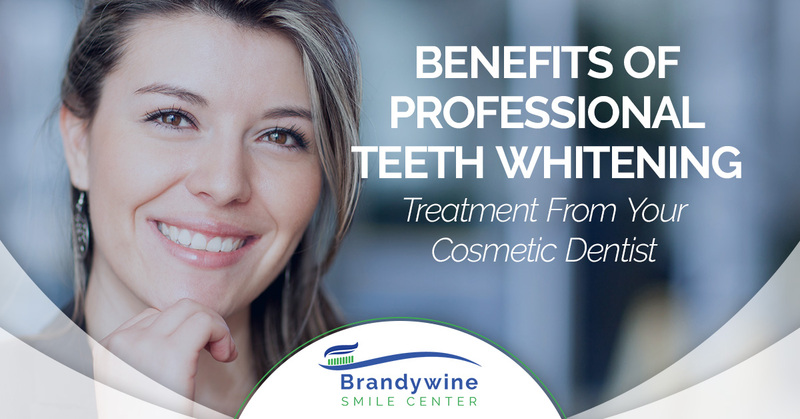 At Brandywine Smile Center, we offer both in-office and at-home professional teeth whitening options. In today’s blog, we are going to review some of the benefits of choosing teeth whitening options from your dentist. Over-the-counter and clinically unsupported teeth whitening tips can often lead to unsatisfying results. Extensive research and clinical studies indicate that whitening teeth under the supervision of a dentist are the safest. In fact, many dentists consider whitening the safest cosmetic dental treatment available. When it comes to teeth that are dull and stained, there are two issues at hand: intrinsic and extrinsic staining. Intrinsic staining occurs inside the tooth enamel while extrinsic occurs on the outer layer of the enamel. While some over-the-counter products can help with removing stains that are outside of the tooth, professional teeth whitening can help remove both types of staining. Although certain over-the-counter teeth whitening products are known to show results, it can often take weeks — or even months — to achieve the whitening results you are looking for. However, with a professional in-office treatment, you can get your teeth whitened in under an hour and all you have to do is sit in the dentist chair. Plus, you can often brighten your teeth by four to nine shades in just one appointment. One of the biggest complaints of over-the-counter teeth bleaching products is that that often cause sensitivity and pain. However, professional teeth whitening treatments are not known to cause this level of discomfort. Many professional teeth whitening methods require personalized trays that are fabricated for your treatment. These trays will fit in your mouth more comfortably and perfectly than when compared to over-the-counter alternatives, which often cause irritation or discomfort. Over-the-counter teeth whitening kits and products have been known to cause irritation, sensitivity, and damage to the gums. And, although this irritation and damage are typically temporary, it still goes to show how great the product is for your oral health. 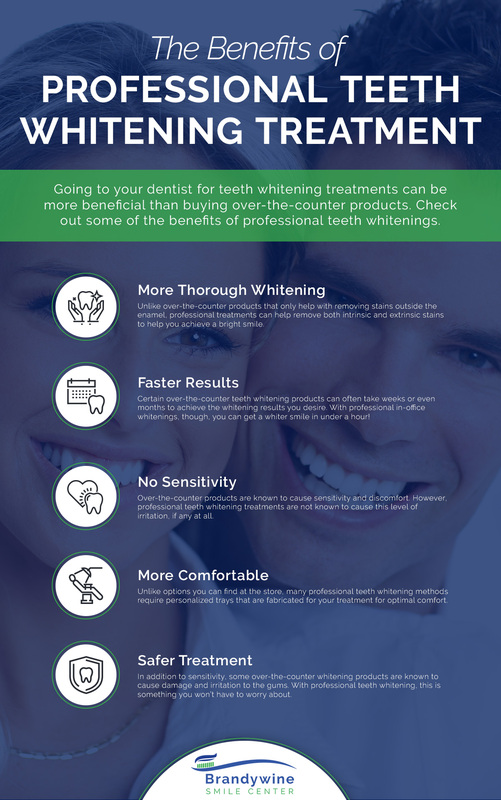 As you can see, there are many benefits to seeking professional teeth whitening treatments instead of over-the-counter options. Not only is professional teeth whitening faster and more effective, but it is more comfortable. Do You Need Teeth Whitening in Glen Mills, PA? Opalescence Go Whitening, and customizable tray bleaching, we have the treatments you need to attain a bright and beautiful smile.